As the festive season is fast approaching, I thought I'd take a look back at a few of the toys and games that I received for Christmas back in my 70s and early 80s childhood in the UK. However, I'm pretty sure that some of these were popular in the U.S., too, so if you're one of the 50% of visitors from across the pond then I hope you will find something you can relate to. I'm only going to feature the more traditional style gifts, rather than the electronic toys that are often mentioned. No doubt, I will come back to this post from time to time to add more items that I suddenly remember playing with back in the day. 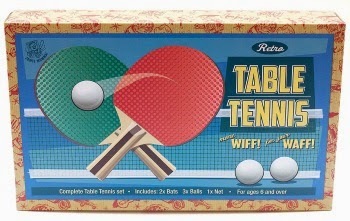 I remember being very pleased to receive a table tennis set. However, being short of cash meant that my parents couldn't afford a proper table tennis table, so we made do with the pasting table that was gathering dust in the loft. It was a bit narrow, but we still managed to, somehow, set-up the net (after dusting off all of the cobwebs) although it was a bit uneven, to say the least! Just about every child received a net of marbles at some point in their childhood, and the game was very popular in the school playground back in the 70s and 80s. 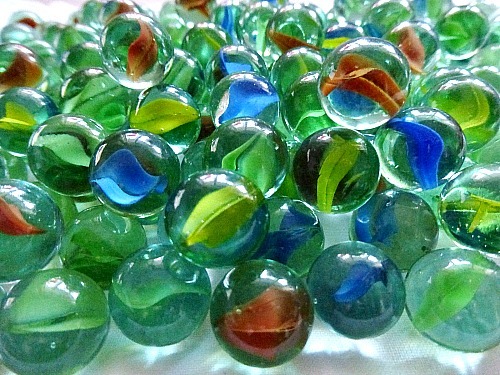 The traditional, clear glass marbles (shown above) also came in larger sizes. I remember someone bringing in some very colourful non-clear glass marbles which he called "Chinese" marbles, and these were given a higher status that the standard ones - you would have to strike his marbles several times to win it! It all became simply ridiculous when someone decided to bring in giant ball bearings from the local scrap yard, and the rules of marbles were thrown out of the window. The competition between the boys was not how well they played the game, but who owned the biggest spherical object! It reached a point where many kids decided to revert back to using the classic clear glass marbles, once more. 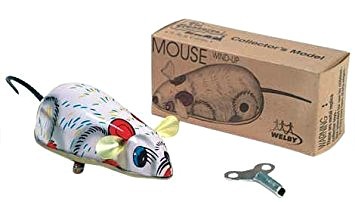 I remember receiving a wind-up (clockwork) tin mouse which would race across the floor and then performing several quick spins, before shooting off in a straight line again. My pet dog (Jack) used to chase it across the room, and was fascinated when it spun round in a circle. I was pleased to see that you can still buy these at Amazon. This classic game has been around for donkey's years and, no doubt, almost everyone has played this simple game at some point in their lives. After randomly distributing the sticks (ie throwing them onto a table) the idea of the game is for each player to try and pick-up a single stick without disturbing the other sticks. 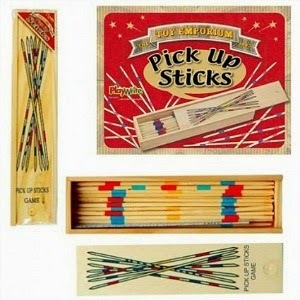 This was simple family fun and ideal for a grey and wet British Christmas. You would sometimes discover a Mini wire puzzle inside a Christmas cracker and then, instead of relaxing with a glass of mulled wine, you would find yourself spending the evening losing your temper trying to solve the darn thing! 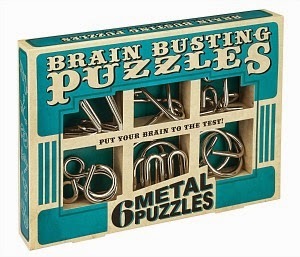 The idea is to separate the two interlocking pieces of the puzzle and reconnect them, and there are now many puzzles available at Amazon.co.uk, some of which come in retro style boxes. Fleetway (part of IPC Publications) published dozesn of comics and annuals and just about every British child would have received at least one during their childhood. As well as the Cor! annual, I also received the Jackpot for the Christmas of 1982. The annual was published between 1980 and 1986, with the comic itself having a relatively short run from 1979 until 1982, costing just 10p when it was first published. There isn't much information around about this particular game, although one source suggests the game originates from the early 1980s and was published by Spears. I believe that was the version I unwrapped for one Christmas and it was flipping fun! 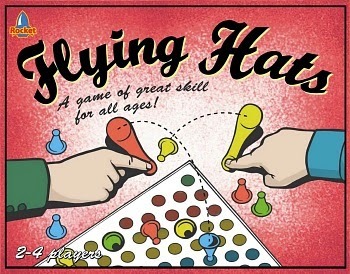 Each player has a flipper and matching coloured hats and the idea is to flip your hats into the correct holes. I guess the game has similarities to tiddly winks, but I found it a lot more fun. You can still buy the game using the link beneath the picture above. 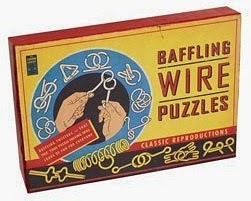 This game was first sold in 1934 by Parker Brothers and I remember it being advertised on British TV during the 1980s. The gameplay is like an advanced version of Ludo, where each play tries to get all of their four pawns around the board and back home as quickly as possible. However, unlike Ludo you have to draw an instruction card and not rely purely on the luck of the dice. Sorry! is still sold today and there was a rule change in 2013 which now means each player has only three pawns, rather than four. 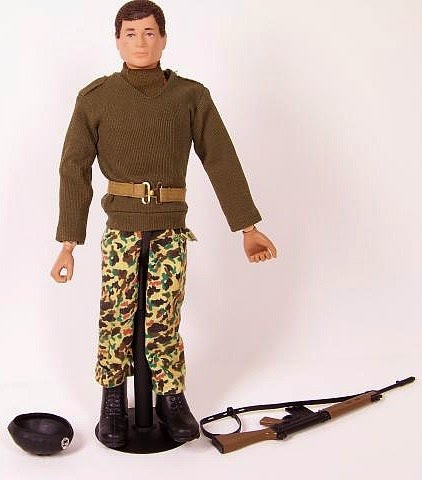 That action man featured above came about ten years before I received one for Christmas. During the 70s, Palitoy introduced eagle eyes and gripping hands. Mine also had fuzzy, blonde hair. Unfortunately, it was thrown away many years ago - why didn't I keep it? You can see many more traditional toys and games at my website SimplyEighties.com and you may also be interested in the section 70s and 80s Toys you can still buy today.